Salads are packed with fresh, fibrous and nutritious ingredients like raw fruits, sprouts and veggies. They are also as tasty as can be, thanks to the exciting blend of textures, flavours and natural aromas. We have carefully selected the ingredients and all the salads are 100% vegan and avoid the use of ingredients like honey, cream, yoghurt and butter. 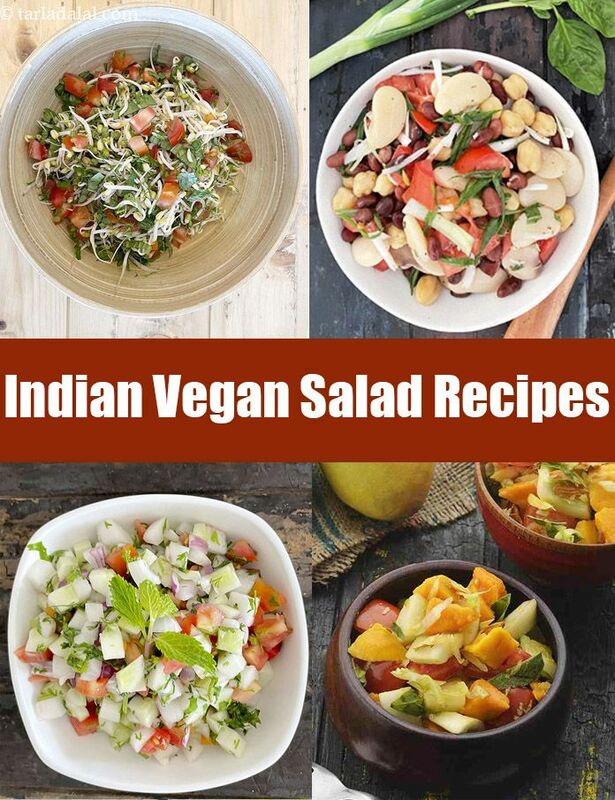 We have included a variety of salads ranging from all veggie salad like Cabbage, Carrot and Lettuce Salad to only fruit salad like Apple Chickoo Salad with Muskmelon Dressing or a combination of fruits and veggies like Veg Mango Salad. From simple basil dressing Lettuce, Tomato and Cucumber Salad with Basil Dressing to fruity dressing to fruity pineapple dressing Apple, Banana and Date Salad we have used all to make them more palatable. These can be served as a part of the meal or even as in-between snacks as healthy low calorie vegan food choice. Colourful and tangy, the chick pea salad has a very peppy accompaniment. Savour the tanginess of tomatoes, green chillies and lemon juice; the wholesomeness of chick peas and potatoes; and the chat-pati hints of black salt and chaat masala, all in one enticing package!